AMI’s PoC array customers in most cases develop their own custom instrumentation to run assays on their particular custom formats. AMI develops custom tools and fixtures to manage the manufacturing processes for array production and cartridge assembly as required. AMI can also apply engineering resources to assure optimum integration of assay instrumentation with array formats, for optimum Design-for-Manufacturability. Arrays manufactured on multi-array slide and 96/384 well microtiter plate formats can be processed on any commercial liquid handling system designed for the assay chemistry process ( reagents, temperatures, agitation etc) and array readers with the spot size interpretation and analysis capabilities for that custom array content. Where a customer does not already have that instrumentation in place AMI offers a preferred instrument set that offers simple operation, repeatable performance and low capital and installation costs. Essentially establish a DNA or Protein array instrumentation capability within a month for under $50k USD. AMI now offers Innopsys scanners, the most complete range of fluorescence microarray scanners on the market. 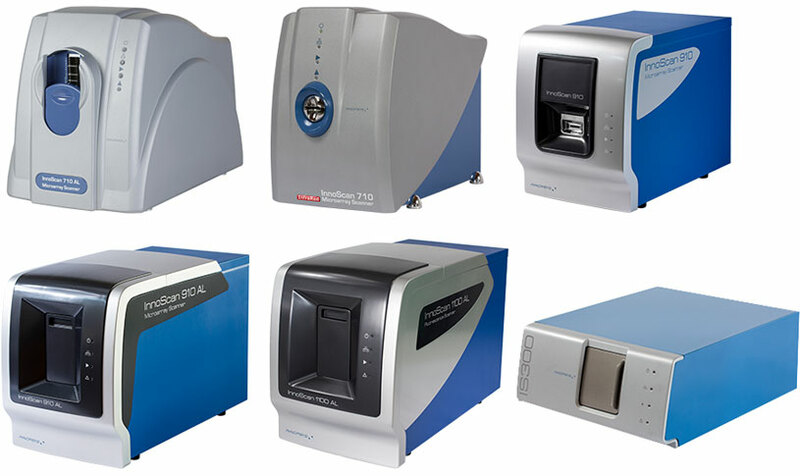 The instruments range from the InnoScan 300, a single-color easy-to-use scanner for clinical applications, through the InnoScan 1100 AL three-color ultra-high resolution fluorescence imager. Brochures and technical specification on the instruments. Contact AMI for more information. The Crocodile is also available in a 5-in-one version, which includes an ELISA Reader. AMI collaborates with Redbud Labs to enable up to 10x faster microarray assays. Redbud Labs has developed a microfluidic mixer, called MXR, that is ideal for integration into point-of-care cartridges. MXR is a pop-in module that introduces agitation directly into the detection chamber, boosting reaction kinetics for both genomic and proteomic applications. Adding MXR has minimal impact on cartridge design, cost, and complexity, but can dramatically improve test performance. This microfluidic mixing approach complements traditional methods for optimizing sensor design, such as surface chemistry and probe selection. Redbud Labs and AMI work collaboratively with your team to deliver a robust, cost-effective integration. MXR uses a small magnetic driver that can be integrated into a larger diagnostic system. Redbud Labs also offers a temperature controlled driver called the Redbud Stage for research and development environments. To try MXR, contact Redbud Labs. The Vidia Microarray Imaging System is an easy-to-use, fluorescence-based imaging system for multiplexed assays. Vidia is compatible with both 96-well plates and standard slides, making it one of the most versatile microarray imaging system on the market! Only one other microarray scanner can analyze both plates and slides, but it costs 2x as much as Vidia. As a true 2D imaging system, and not a standard rastering instrument, it is also much faster than microarray scanners. For more information, checkout the Vidia Product Sheet or click the “Request a Quote Tab” to receive pricing information. Multiplexing immunoassays immediately saves valuable time, reagents and samples. With an entire assay (array) in each well of a 96-well plate or multi-well slide, much less coating material is required per assay compared to standard ELISA. Read dozens of data points and test a multitude of markers simultaneously to increase throughput in your lab. Vidia is built to ensure reproducible results and low maintenance operation in a compact design. High-power LEDs are utilized for excitation of fluorescent dyes and a sensitive CCD camera provides detection for this 2-channel green/red (e.g. Cy3/Cy5) imaging system. No moving parts in the optical system along with our user-friendly software ensure each spot is found and analyzed properly, assay after assay. Learn how Vidia compares to other microarray scanners on the market on the Vidia Comparison Sheet. Vidia is CE marked and intended for research and investigational applications only.